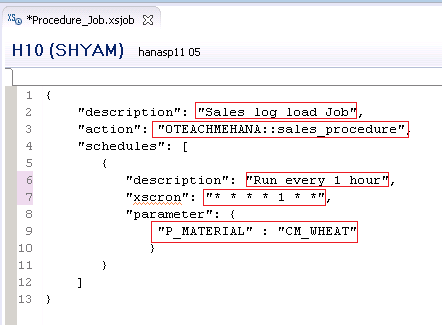 Welcome to the Part-3 tutorial on SAP HANA XS Jobs. In the Part-1 tutorial, we have already learn what an XS Job is and why it is used. 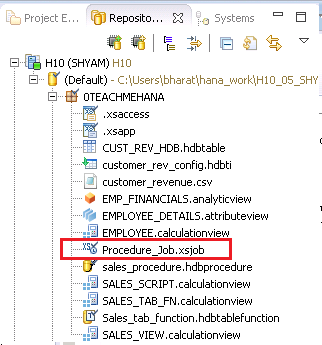 In Part-2, we learnt the pre-requisite configuration files needed for SAP HANA XS development artifacts to exist. Be sure to check them out before reading this one. 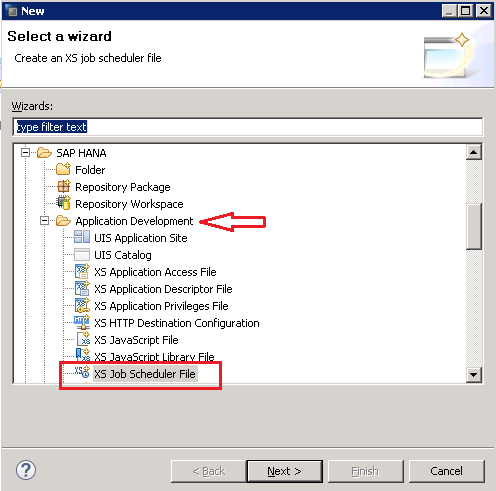 In tutorial, we show you how to create a job file. Firstly, let’s take a moment to revisit the stored procedure we created in our previous tutorial Stored Procedure. The functionality has already been explained in detail. The important thing to note here is that there is an input parameter here by the name of P_MATERIAL and the procedure would need this value as input from the XS JOB whenever it is called. The result of a call to this procedure should be that the SALES_LOG table would become filled with the sales details of the material number provided by the input parameter P_MATERIAL. Press F8 or the execute button. The result below shows that currently, the sales log table has no data. 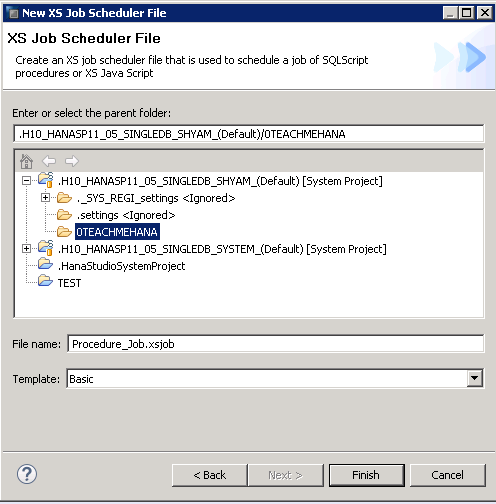 Search for XS Job Scheduler or find it in the “Application Development” folder as shown below. Provide a file name to the job and make sure to keep the Template setting to Basic (which is the default setting). 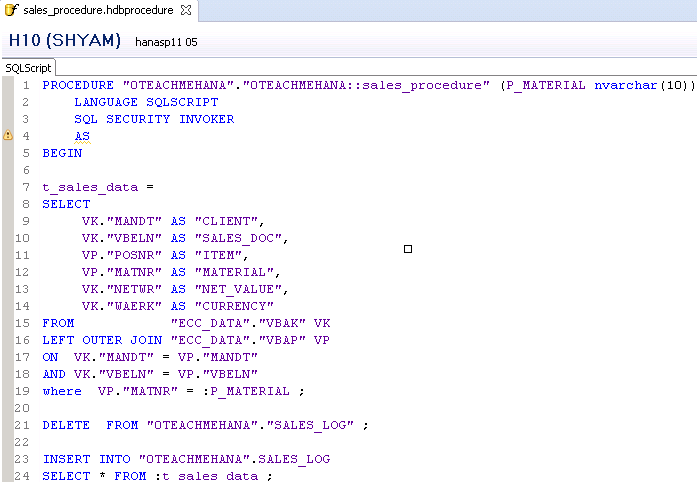 Using “Basic” templates help us save time in writing codes as the skeleton of the code gets auto-created by SAP HANA. As seen below, I named the job as Procedure_Job ( It seems I lack creativity in naming things but… it will do for now). 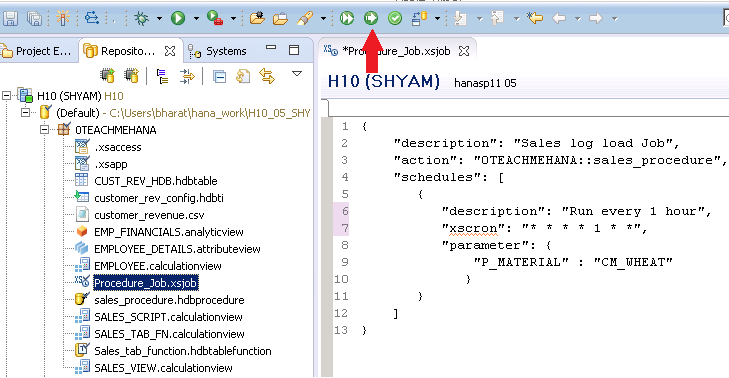 The default code for the “Basic” template is provided by HANA as shown below. The parts of code enclosed in the red outlines need to be modified as per our requirement. Let’s understand this line by line. Line 2: description : This is the description you give for this Job. Line 3: action : Here you provide the Stored Procedure or XSJS function name which you wish to run. The name must be complete with the package path prefixed to it. Line 4: schedules : This block contains the properties of the schedule frequency. Line 6: description : This is the description of the job frequency. Line 7: xscron : This provides the frequency of the job. Refer the below table for details. Credits: The above table is provided by SAP at this link. Remember that the below code is not SQL and hence even the string values are enclosed in double quotes “ “ instead of single quotes. The code was modified as per our scenario as shown below. 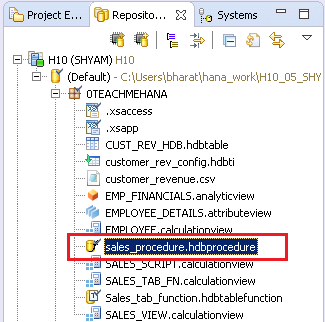 Line 3: Action is to run the sales_procedure stored procedure under the 0TEACHMEHANA package. Line 9: The input parameter P_MATERIAL is being assigned the value “CM_WHEAT”. This value would be passed down to the stored procedure for execution. Activate once done by pressing the activate button shown below. Now, your xsjob would be available in active version as shown below. It’s quite a simple procedure and HANA does most of the codes for you. All you need to do is change the sample values given and punch in the values you need as per your scheduling requirement. 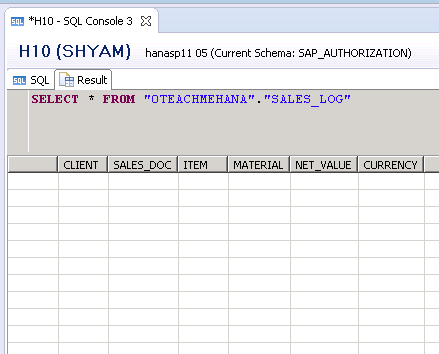 I hope that I made it simple enough for a beginner to understand SAP HANA XS jobs. 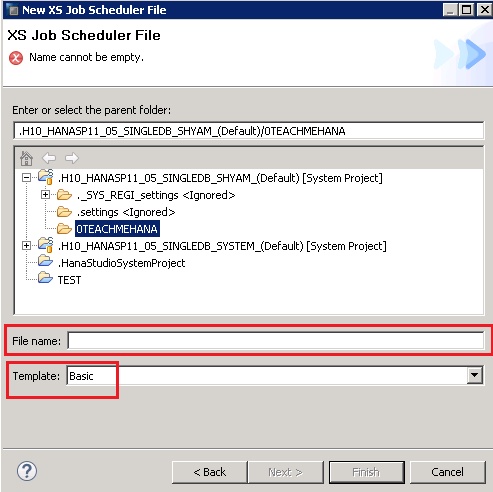 Join us for our next tutorial where we learn how to schedule this xsjob. 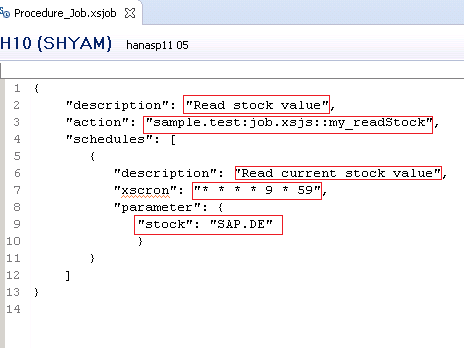 Leave your comments below on how you fared in creating your own SAP HANA XS Jobs and make sure to share this tutorial across social media. Subscribe to our newsletter when it pops up for updates on our newest additions. If you feel the website helped you, please also contribute any small amount by using the “Donate button” on the right side of this page to help with the operational costs of this website and other systems involved. Stay hungry.. stay motivated. Adios! Tagged sap hana xs jobs. Thanks Shyam:), never thought it was this easy to learn XS. Hats off to your way of explaining. Thanks Manue. Watch out for my tutorial on scheduling XS jobs. It will be live by Saturday for sure. Your post very clear and your explanation very good. I like it and will be waiting new post about hana. I got Same Requirement in current project,Thanks for Helping out your Tutorial. i need info from u Text me @venkateshsaph@gmail.com or Ping me @9441937817. Glad I could help. Please share a tutorial to support us. Hi, very good tutorials. In the xs job scheduler, can you put more than one procedure in the “action” parameter? If so, is there a limit to the number of procedures that can be entered?